But, was that the end of Dorothy, Blanche, Rose and Sophia? Have the Golden Girls shown up on other shows? Which Golden Girl appeared on five different TV series? 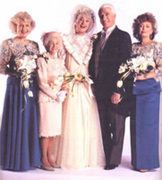 What have Bea Arthur, Rue McClanahan, Betty White and Estelle Getty been doing since the sitcom ended? Will we ever see a reunion? Tune in and find out! I enjoy the Golden girls they are very funny though only rue and Sophia and Bea have passed away. But on the show all of them are funny and humorous and then will make some sense. Can you tell me the name of the man who played Stan on the Golden Girls and where is he now? Steve Pleau » Herb Edelman and he passed away in 1996. I love the Golden girls and I know everyword to almost every episode!!!! Okaaaay, you discovered our dirty little secret — Betty White is paying us off. Actually, Golden Girls is just a very popular show and there’s a lot of interesting information available. We’re trying to balance out the site with articles about both recent and classic shows. That being said, rest assured that this is the last bit on The Golden Girls. Thanks for the feedback and for visiting! Why is there so much “coverage” of the Golden Girls on this site?! Don’t you people think it’s a little excessive?!? !